Rooflights can be harmoniously blended into any architectural structure. The two-, three- or four-shell acrylic or polycarbonate is weatherproof and has a high self-cleaning effect. The polycarbonate sheets are 16mm or thicker, and are hail-resistant and vandalism-proof. Length and width of the roof lights can be easily varied. The light transmission in the standard opal product is 75%; the colorless clear product’s transmission is 83%. This transparency remains in place even after several years. BÖRNER’s Rooflights can be used in all buildings to ensure uniform lighting. Opal acrylic glass or polycarbonate is glare-free and therefore ideal for production or sports hall glazing. 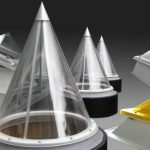 Despite its low weight per unit area, the roof lights also provide excellent sound insulation. The materials are completely fire-safe: minimal smoke development, no burning drops, and very few toxic fumes are produced. The acrylic and polycarbonate products completely fulfil DIN 4102 standard in fire protection for construction materials and components–a very special feature of these materials. BÖRNER’s Rooflights can be adapted to individual construction needs for our customers. Rooflights up to 6,000 mm widths can be produced. Frames and installation is done by our professional installers. Sheet steel is used for free-supporting versions up to 6 metres (type statistics available). Rooflights are combined with polycarbonate multi-wall sheets, with U values up to 1.35 W/m²K. Design consultation with the concept of preventive fire protection. Acrylic multi-wall sheets can be glazed up to a maximum width of 3,000 mm and a U value of 2.4 – 2.9 W/m²K. We provide our customers with individual light calculations in adherence to construction guidelines. We provide advice for optimal rooflight size on the basis of our calculations. We calculate the required ventilation area in conformity with fire department regulations. The number and size of smoke louvers is determined in this way. 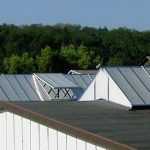 In general, all BÖRNER Rooflights are equipped with smoke and heat vents. Thermally-formed smoke and heat extraction louvers are provided with a supporting structure made of glass fiber-reinforced polyester resin. The double-walled strips function as both heat and cold insulating elements, and lead to the water-drainage area. In addition, smoke louvers are particularly well-suited for ventilation and fire protection: The fire protection louvers are opened automatically when the temperature of the environment reaches 68 deg. C (or 90 deg. C if sprinkler equipment is present). For daily ventilation, a 230V E-motor with 300 mm or 500 mm lift can be installed – this can also be installed with smoke exhaust. Smoke and heat extraction and ventilation can be controlled, if desired with pneumatic lifting cylinders (2-way system with on-site compressed air).